Oil & Tempera on Canvas, Louvre Museum, Paris. The history of this stunning painting begins with a mural on the wall of a house in Mantua, Italy, which depicted the Madonna with saints. 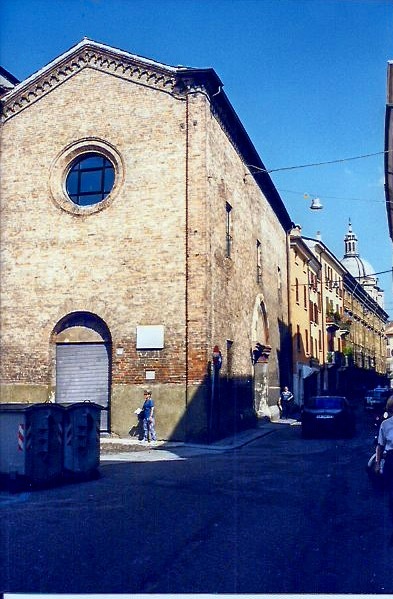 In around 1495, a Jewish banker named Daniele Norsa purchased this house, and received official permission from Francesco Gonzaga, Marquis of Mantua, to remove the mural. Bad idea! The populace reacted violently, stirred up by a mystic priest who predicted the destruction of Norsa's house and replacement of it with a chapel and a magnificent painting: a self-fulfilling prophesy. Although the general population of Italy at the time was very anti-Jewish, families like the Norsa family were often invited by the rulers to provide financial services, which were off-limits to Christians because any loans at interest were classified as usury. The profits accrued from Jewish banking were heavily taxed by the rulers, who managed to profit from "usury" even if they couldn't practice it. This had the additional benefit of directing hostility on the part of debtors towards the Jews, not towards the rulers whose profitable role was often quite hidden. Jewish Italians had little choice but to be bankers. They were prohibited from most other professions and occupations, and had no civil rights, though their ancestors had lived in Italy since Roman times. Essentially, they had to bribe the rulers for the right to live and work in their territory; they were always at the mercy of the rulers and sometimes of the mob. The Norsa family had lived in Mantua for generations, and mostly had been protected by the Gonzaga family; in fact Isabella d'Este, the Marquess of Mantua, had tried to avoid anti-Jewish violence somewhat earlier when she was left in charge during one of her husband's absences. Protests against Norsa's removal of the mural became violent, and Gonzaga was obliged to react. He had recently been in service to Venice as a condottiere, or hired general, in one of the numerous wars that were taking place in Italy at the time. Chronically short of money, he was looking for a way to finance a memorial to his great victory at the battle of Fornovo: just what the mystic, Girolamo Redini, predicted. 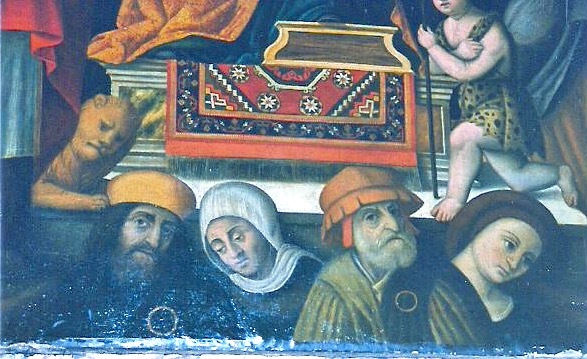 The painter Mantegna was in Gonzaga's service, and Gonzaga wanted him to create a great painting. A chapel -- Santa Maria della Victoria -- would be built to commemorate his accomplishment, with Redini's dream painting in the place of honor. 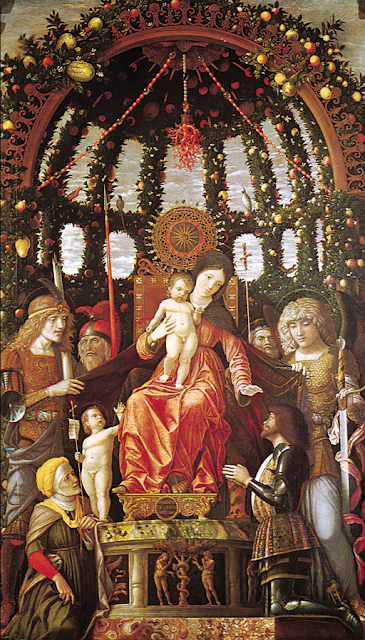 If you look at the painting, above, you can see a portrait of Gonzaga in armor, kneeling before the Madonna's throne, along with a wealth of symbols from Renaissance religious iconography (more at this blog post). Although Norsa had already promised to commission a replacement mural on the wall of his house, this wasn't enough. The house was razed to make room for the chapel, and Norsa's assets were confiscated to pay for both chapel and painting. I have been fascinated by Mantegna and by this history of the mural that isn't there for a long time. 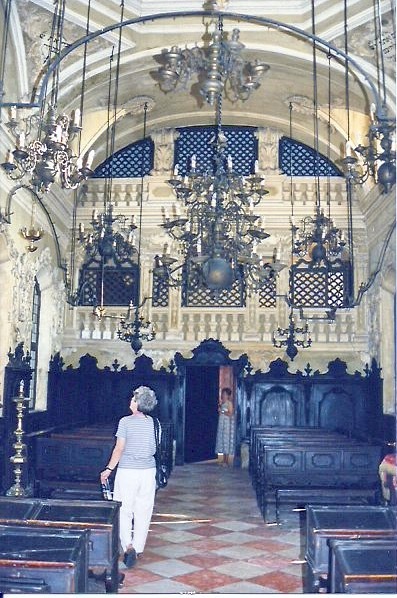 In 1998, I visited Mantua trying to learn more about the history of the Norsa family. We found the chapel, but it was closed and evidently rather run down and in need of maintenance. A web search today indicates that it's been restored and is now open to tourism. Mantua, Chapel of the Victories, 1496, on the site of the Norsa home. Italy and took it for the Louvre. Another Madonna of the Victories by an unknown painter. At the bottom are portraits of the Norsa family. 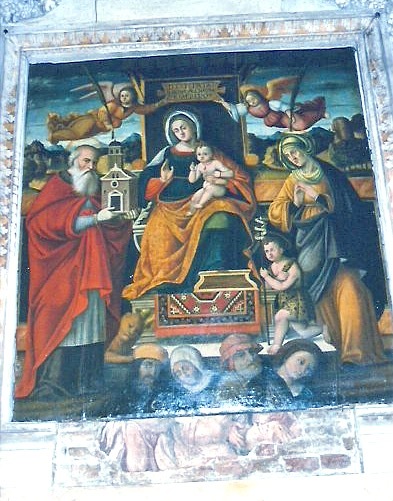 This painting hangs in the Basilica of Mantua. Portraits of the Norsa Family. The men are wearing the Jewish badge. In Renaissance Italy, the badge was a circle. For more about the Norsa family see this page of Jewish Virtual Library: Norzi. ...art from a bygone time. Great story about the chapel and the mural. I had no idea that Jews were already persecuted and had no rights centuries ago. Great murals and interesting story. I like that. This is fascinating, Mae. So often we see a work of art and have no idea of the story or symbolism behind it. I had no idea about this chapter in history. Thanks for sharing it. Interesting read about the mural. This is all new to me and good with the chapel. Thanks for sharing! That's quite a story. So much history here. Fascinating history and wonderful photos! Do Murals Make Us Human?